For decades, Horizon Lines provided regular shipping service between Tacoma and Anchorage, Kodiak and Unalaska. But Horizon Lines no longer exists. In December, the company ended its operations in Puerto Rico. Its Hawaii services were sold to the Pasha Group and last Friday, Matson Navigation Company finalized the acquisition of Horizon’s Alaskan operations for $469 million dollars. 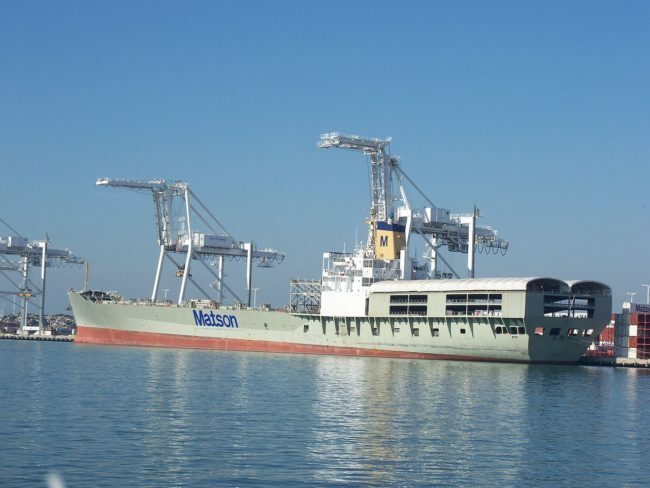 Matson Spokesman Jeff Hull declined to have his comments recorded, but in a phone interview he says any major changes following the acquisition are likely to be in name only. “The acquisition was a matter of growth,” Hull says. He says Matson will retain the same union contracts, operate the same shipping schedule and continue to run the same three vessels in Alaska. Hull says there will be some minor restructuring to duplicate corporate positions in Washington State, but no personnel changes will be made on the ground in Alaska. McLaughlin doesn’t anticipate any major changes in Dutch Harbor either. “Unless there’s some reason for Matson to come out and sit down with us and discuss operational changes, we’re just going to assume that its’ business as usual,” she says. Horizon Lines used Unalaska’s municipal dock for more than two decades. A special contract with the city lapsed at the end of 2013. Horizon then paid tariffs to move cargo through the port. Both McLaughlin and Hull anticipate that agreement to continue.